Russian billionaire Vladislav Doronin has built a peculiarly-shaped house for his girlfriend of two years, UK supermodel Naomi Campbell. ­The house shaped as an ancient Egyptian symbol – the eye of Horus – was built on the Isla Playa de Cleopatra off the Turkish coast by renowned Spanish architect Luis de Garrido. Known for his hi-tech designs featuring a serious approach to environmental and ecological criteria, Garrido’s design for the 25-bedroom mansion design boasts complete self-sufficiency in energy and water. 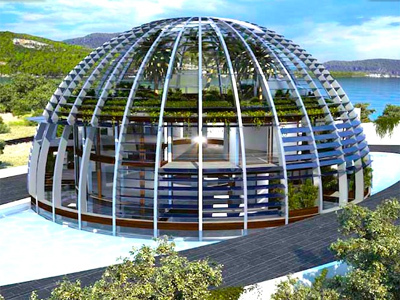 A sophisticated system of solar batteries provides enough electricity for each of the five massive dining-rooms and the living quarters, and the glass ceiling creates a sort of greenhouse effect that helps to keep the place warm, while rainwater-harvesting and bio-treatment systems guarantee sustainable usage of water resources. Thus, the house consumes a very modest amount of energy and water and maintains a low level of emissions. Garrido has dealt with peculiar shapes, but in his latest work he has outdone himself. The multi-level central glass dome is based on a steel carcass, with the upper level serving as a terrace with an excellent view. Combined with the second, long and narrow part of the building, it forms the shape of the eye of Horus: an ancient Egyptian symbol of royal power, good health and protection in both the worldly realm and the afterlife. In more recent history it has been associated with conspiracy theories, particularly with the all-seeing eye that is the symbol of the New World Order. ­A house shaped as an Egyptian symbol strangely mirrors late 2010 rumors that the two planned to have a wedding in a 3,000-year-old Egyptian temple. Campbell and the Russian property billionaire have been dating since 2008, and last year Campbell moved to Moscow.